Christine Howe is Professor of Education at the University of Cambridge, and Fellow of Lucy Cavendish College. Previously she was Professor of Psychology at the University of Strathclyde. Her main research interests are peer interaction and conceptual growth, children's reasoning in mathematics and science, and communication and social relations among children. In addition to publishing seven books and over 100 journal articles, Christine was for many years co-editor of the journal Social Development and has served as Chair of the British Psychological Society's Developmental Section. 1. Peer Groups in a Cultural Context. 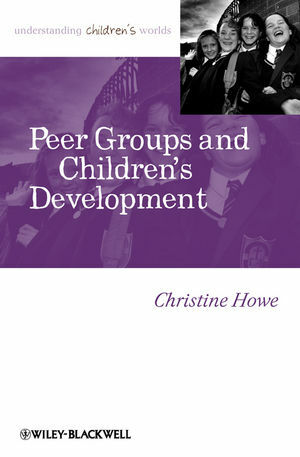 Peer Groups and Children’s Development. 2. Peer Groups and Classroom Structure. The Peer Group Structure of Classes. The Structure of Classroom Subgroups. 3. Performance and Cooperation in Classrooms. Whole-Class Interaction and the Performance Mode. Subgroup Interaction and the Cooperative Mode. 4. Cooperative Interaction and Curriculum Mastery. Piagetian Perspectives on Cooperative Interaction. The Social Impact of Classroom Interaction. 5. Friendship, Status, and Centrality. Peer Status in Formal Groups. 6. Individual Differences in Informal Experiences. 7. Social and Personal Adjustment. Peer Groups and Antisocial Behavior. Peer Groups and Personal Adjustment. Peer Groups and Educational Failure. Classroom Practice and Developmental Outcomes. 9. Implications for Practice and Future Research. Qualified Endorsement of the Cooperative Approach. Future Research and Theoretical Development. particular chapters, useful as they explore the nature of peer groups in educational settings.